HOUSTON, Texas -- Family and close friends injected humor into an emotional final funeral service Thursday for president George H.W. Bush. The president died last week in his Houston home at age 94. Thursday's service comes after a state funeral was held at Washington National Cathedral. Bush had been lying in repose at St. Martin's Episcopal Church, where a procession of mourners paid their respects overnight. George P. Bush, one of the president's grandsons, told mourners Thursday that the former president would challenge his grandkids to games like "the first to sleep award." The line drew laughs at St. Martin's Episcopal Church in Houston, where the Bush family worshipped. The 42-year-old holds the office of Texas land commissioner. He joined former Secretary of State James Baker in eulogizing the 41st president. 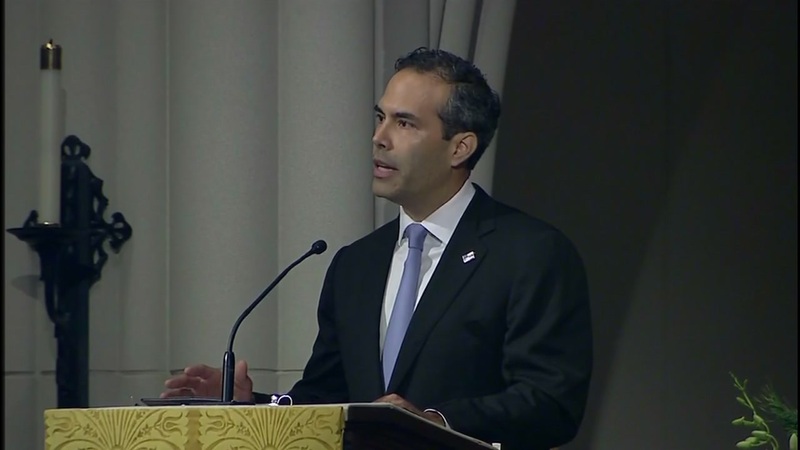 George P. Bush shares candid moments about his grandfather in his eulogy. Former Secretary of State James Baker remembered his longtime friend Bush as having "had the courage of a warrior but the greater courage of a peacemaker" during an emotional eulogy. Baker began the eulogy with an apology. Using the nickname "Jefe," which is Spanish for "boss," Baker said he was going to brag about Bush, even though the former president hated boasting. He called Bush the "best one-term president" in the nation's history. He also praised Bush's grace after the fall of the Berlin Wall, saying, that Bush understood that humility toward a fallen adversary "is the very best path." Close friend and 61st Secretary of State James A. Baker delivers eulogy at President Bush's funeral. The Rev. Russell Levenson, Jr. told mourners that Bush had a "resolute faith" and once asked what heaven would be like. He told those gathered at St. Martin's Episcopal Church that he imagined Bush was greeted in heaven by his wife, Barbara Bush, "with her hands on her hips, saying 'What took you so long?'" Levenson said it was OK to cry because Bush was never afraid to shed tears himself. Rev. Dr. Russell J. Levenson Jr. delivers the homily.